Please let me have a few moments of your time so I can tell you about my wonderful husband, Warren, who is facing a life-threatening health crisis. Warren is a very loving father and husband. He has not been able to work since 2002, due to his illness but he still manages to be a Sunday School teacher at our local church. He has been a loving and wonderful foster parent for the past nine years and we have had over 50 children come through our home. Our last three foster children were a sibling group 3 who we fostered for two years and we were finally able to adopt these wonderful children, ages 4, 5 and 6. We also have five other children. Warren suffers from congestive heart failure that has worsened over this past year. 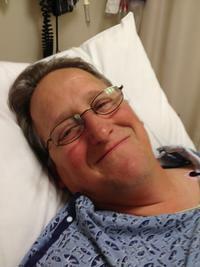 Doctors at Vanderbilt Hospital in Nashville have determined that he needs a heart transplant. He was put on the transplant list and started an IV medication that will keep him stable until a heart becomes available. Heart transplants are life-saving but tremendously expensive. We were told that we need to raise at least $10,000 for co-pays, medications and relocation expenses. Warren’s post-transplant medications will cost $19,400 for the first year alone and it will cost us $1200 a month to live in Nashville while he recovers. To help offset his uninsured costs, a fundraising campaign in Warren’s honor has been established with HelpHOPELive, a nonprofit organization that has been assisting the transplant community for over 30 years. All contributions are tax deductible, are held by HelpHOPELive in the South-Atlantic Heart Transplant Fund, and are administered by HelpHOPELive for transplant-related expenses only. You can help make a difference in Warren’s life. Please consider making a contribution.On behalf of our family, thank you for your thoughtfulness, generosity and prayers. We are back in the hospital since Aug 3 and they said we can’t leave the hospital. They thought we had a rare blood disease, as it turned out there was an error in the reading. On September 5 we received a new heart. We are so thankful to the donor family and so blessed. Now the road to healing begins. We have one more biopsy scheduled on Monday Feb 1′ hopefully we will get to go home and finish therapy and get stronger. We want to thank everyone for their support and prayers along the way. May God bless you all, they way he has blessed us. A Christmas miracle, on Monday December 14, 2015 we received a new heart! We waited 3 1/2 years and finally a miracle happen! Warren is still very sick, we hit a few bumps in the road, but we are on our way to recovery. We want to thank all that have made donations and for all the prayers. Warren and Laura, We didn't realize that you were foster parents to so many children. We have only seen the last three and they are very well behaved. They are always dressed well and have excellent manners. also we didn't realize that you have five other children. We have been praying for y'all and will continue to do so. We have been asking God to help y'all. Best of luck ! Let us know if there is anything we can do to help. We're both retired. Love to y'all ! May God be with your family. You guys have done so much for me. I love yuns.